Did the 1994 1LE's come with a steel or aluminum driveshaft? There seems to be conflicting information out there - anyone know for sure? It's possible that the shaft was swapped out at some point prior to my ownership. The 3rd Gen 1LE had an aluminum DS. The part # is listed in the 4th Gen FAQ. The references I have do not list the aluminum DS for the 4th Gen 1LE package. There was a technical service bulletin (TSB) that provided a 1LE aluminum DS as a warranty replacement for the steel DS (all V8 models) if the customer experienced drivetrain vibrations at high speeds. The issue was the low critical RPM of the stock steel DS. It only reached the vibration RPM at very high road speeds (stock rear axle ratios), but at much lower road speeds w/ a swap to a 3.73 or 4.10 rear. Possible source of confusion - It was widely publicized that the fix was a free 1LE aluminum DS. Perhaps in actuality, the replacement part was the 3rd Gen part, but everyone assumed it was a 4th Gen part. I think you're onto something there Fred. 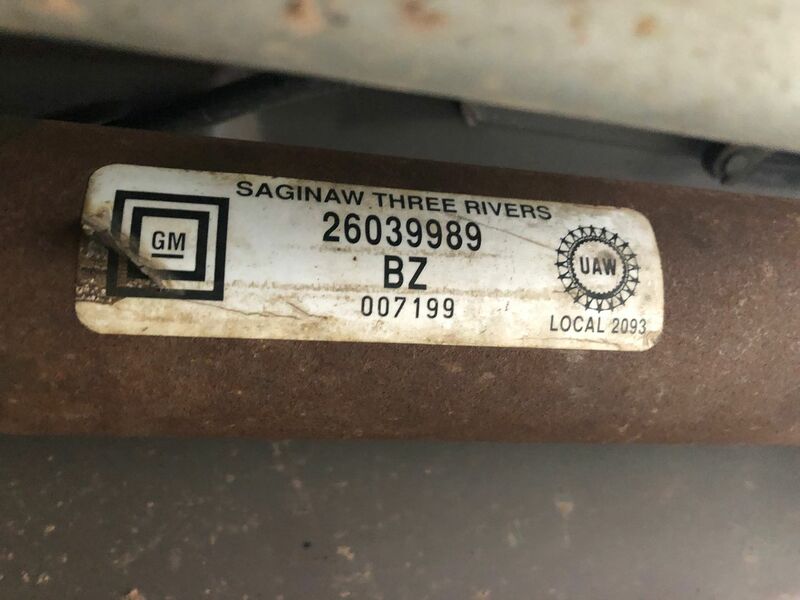 I think too that because the aluminum driveshaft was part of the 1LE package on the 3rd gens it's just assumed that it was part of the 1LE package on the 4th gens as well. In lots of ways the 4th gen 1LE's were a lot less 'special' than the 3rd gens. I suspect the 4th gens were such a leap over the 3rd gens in overall performance that GM didn't need to do as much with the 4th gen 1LE package to make the Camaro competitive on the track. I'm chasing down some general drivetrain harshness and noise on my car - I don't expect it to ride or sound like a Cadillac, but it whines, bangs and vibrates more than I think it should. I know a lot of people switch to the LS1 aluminum driveshafts, but I think I'm going to have my steel one rebuilt and balanced. The steel DS may improve with balance, but the problem is not balance. The problem is the "critical speed" issue. That's a factor of length, weight, etc. I had a failure with an ACPT 4" CF DS. And it happened when the shop that built the engine, running on a basic "keep it running" tune, was driving the car about a mile to a paint shop to have my WS6 hood installed. The front metal yolk assembly broke free of the CF tube, due to an adhesive failure Took me 3 months to get my money back from ACPT, and only after I bypassed the "sales" dolts and went one-on-one with an engineer. Thanks for the info. I did some reading originally on the problems with the LT1 steel shafts and it sounds like that may be compounded on my car given the 4:10 rear it has. My engine is mostly stock (CAI, Hypertech tune and thermostat) so I don't think I'd have any horsepower related problems with an aluminum shaft. More research required! Definitely the 4.10’s if the vibration sets in at ~65 MPH. Spring Set on 1LE? Getting new rear 1LE springs? Is 1le driveshaft thinner than ls1 driveshaft. Part #'s for 1le 35mm and 21 mm antisway bars offered on the 2001 1le package?